Although the iPhone and iPad apps are identical internally—Apple distributes Keynote as a universal binary that runs on any compatible iOS device—the user interface changes to accommodate the iPhone’s much smaller screen. 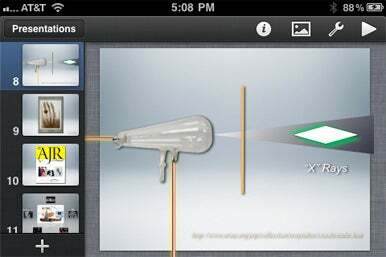 Unlike Keynote on the iPad, the iPhone version doesn’t have a toolbar icon to animate objects. Instead, you tap on the Tools icon and select Animation Mode from the list of options. Many other interface elements are arranged differently on the iPhone, so I had to hunt around a bit to find corresponding functions. Tight Fit: The iPhone’s small screen limits the size of the slide navigator and canvas in Keynote. 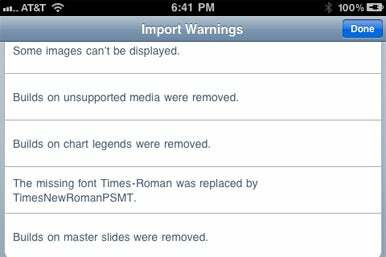 Matters of Import: Keynote warns you about unsupported features when you import a presentation created on the desktop.